Home Communications IT Can You Combine Devices Yet? If you're like most executives, your desk or bag probably contains at least one smartphone, one tablet, and a laptop, if not more. The problem with these multiple devices is they all do a lot of the same things, so you think you'll finally be able to carry fewer things around, but then each have their own little silo of things they do uniquely or significantly better than the others and you still end up toting them around. In an attempt to unify processes and streamline what we carry, we end up carrying more. A new service - Android-only for now, but others may appear down the road - has unified common phone tasks to the point that you may no longer need to keep it with you at all times. - Download the app to your Android-powered smartphone and open it. - It will send a confirmation SMS, then sync your phone's information to its' servers. 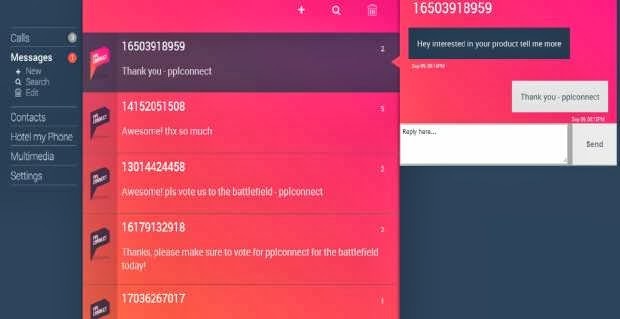 - Logging in to app.pplconnect.mobi gives you access to your phone. Once you're logged in, you can text from any device as if it originates from your phone -- whether that device is a computer, a tablet, or another person's smartphone. You can also call anyone from any device so long as there's a microphone attached, but there's a fee of approx $.03/minute for North American calls, but they give you $2 in starter credits. There are two big caveats here. The first is that, like a lot of cutting edge products and services, this is in Beta right now. That means bugs can still pop up - I tested the software this morning and was apparently sending duplicate messages for over an hour - and some features are not fully available. For instance, MMS (aka: picture/video messages) are not yet supported, and there is no way to add additional money so you can make more calls. Secondly, there are other services in the market that do some or all of these features (though not as well as PPL Connect). The one that comes to mind is Google Voice, which also offers the ability to send texts, manipulate contacts, and make phone calls from a web browser. The differentiators between the two are that Google Voice (under most circumstances) requires you to create a separate phone number, whereas PPL Connect works only with your existing phone number. The ideal piece of software is one that fully replicates the user experience across devices, applications, services, and settings and all, which would certainly allow for a device consolidation. We're not there yet, and until we are, services like PPL Connect are taking those baby steps to get us there.